1)Get the DTC(Diagnostic Trouble Code) that is stored in your ECU that caused the CEL(check engine light), ie P0140, P0134, PXXXX, etc, from your local AutoZone/Parts store. THERE IS NO SCREW that you turn on the ECU like the older 4th gens had and it flashes you the codes. 2000-2001s must use the Autozone guys OBD(On Board Diagnostic) tools or buy one of the online OBD scanners like Alex Peppers' tool(google it). 2K2+ guys can get the SES light to flash the codes by following studmans' procedure off his website, click !!!HERE!!!. 2)Check the FAQ's !!!HERE!!! for what the DTC means and see if there is a possible link to posts from other members who might have ALREADY gone through this same issue and fixed it. If not, once you fix it, post and ask us to add it. 3)Check the TSB's, Technical Service Bulletins !!!HERE!!! that may cover the repair or at least tell you what needs to be done to fix it. 4)If there isn't a link for your DTC PXXXX, then use the SEARCH. If you don't know how to SEARCH, GO !!!HERE!!! 5)*AFTER* reading through the thread(s) that the search pulls up, if you don't know what to do **THEN** post your question with: "PXXXX - How do I fix this?" !!!! ALL THREADS SUSPECTED OF NOT COMPLYING WILL BE LOCKED/DELETED !!!! During my time here, I have learned that most SES threads are O2 sensor related. 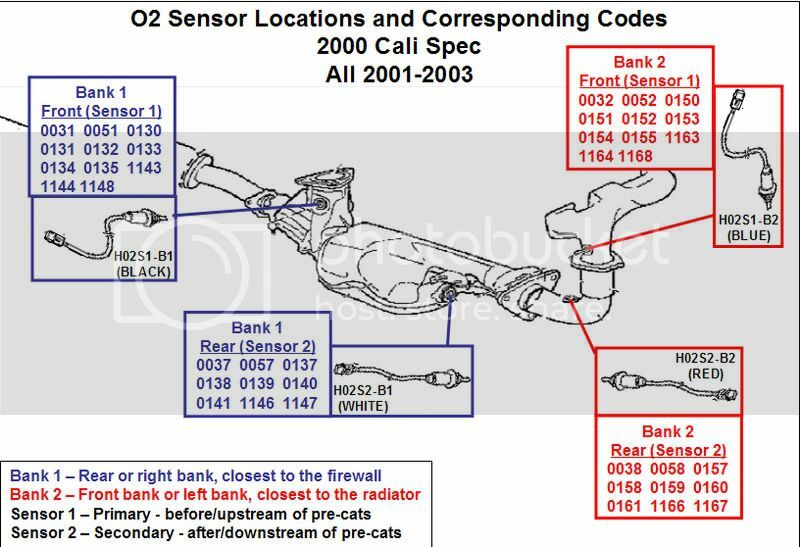 Whenever people have a code that is related to an O2 sensor, they always have to figure out exactly which sensor that it corresponds to (bank 1 & 2 and sensor 1 & 2)....so i created this. EDIT: Here is the final version. I realized that the text on the picture from the TSB was very grainy and almost unreadable. With the magic of Powerpoint and Photoshop, I cleaned it up. While I was at it, I moved the sensors to separate the banks (bank 1 left and bank 2 right) so it was easier to read. This also allowed me to place the sensors so they would line up with where they belong. Last edited by irish44j; 08-04-2008 at 07:11 PM. Here's the National Highway Traffic Safety Administration website which you can use to find TSB numbers. Finally updated my website and uploaded 5 pages of the Brake Rotor TSB in jpg format. Visit the URL for the latest TSB information. The number of vehicles potentially affected is approximately 67,000. Please review the disclaimer located at the bottom of this page for more instruction. One of the parts of the front suspension on your vehicle which is called the transverse link may break where it is mounted to the frame. This may cause a knocking sound and abnormal steering. This may result in difficulty controlling the vehicle which, if ignored, could cause a crash. In order to prevent this incident from occurring, your Nissan dealer will replace the transverse links on the left and right sides with new ones. This free service should take about two hours to complete, but your Nissan dealer may require your vehicle for a longer period of time based upon their work schedule. Contact your Nissan dealer at your earliest convenience in order to arrange an appointment to have your vehicle repaired. If you notice a knocking sound from the front of your vehicle and/or abnormal steering, you should stop driving and contact your Nissan dealer to arrange to have the vehicle towed to the dealer for repair. If the dealer fails, or is unable to make the necessary repairs free of charge, you may contact the National Consumer Affairs Office, Nissan North America, Inc. at P.O. Box 191, Gardena, California 90248-0191. The toll free number is 1-800-NISSAN1 (1-800-647-7261). If you reside in Hawaii, please call 1-808-836-0888. You may also contact the Administrator of the National Highway Traffic SafetyAdministration, 400 Seventh Street, S.W., Washington, D.C. 20590 or call the toll-free Safety Hotline at 1-888-327-4236. Nissan recalls may apply to specific VIN ranges, and due to equipment variation, options, prior repairs, etc., your vehicle may or may not be involved in a recall. To determine if your specific vehicle is affected by any recall, please contact your local Nissan dealer. It will be necessary to supply the vehicle make, model and identification number (VIN) to the dealer. now has PDFs of about a third of the TBS posted for download. Last edited by NmexMAX; 03-15-2011 at 11:00 AM. Last edited by Puppetmaster; 02-25-2009 at 05:12 AM. Last edited by Puppetmaster; 11-02-2011 at 06:02 AM.